The whole of creation took 6 days. The number 6 is not to be taken literally, but rather is symbolic. "Let us make man [humans] in our image, after our likeness: and let them have dominion over the fish of the sea, and over the fowl of the air, and over the cattle, and over all the earth, and over every creeping thing that creepeth upon the earth." So Elohim (the Gods) created man [humans] in their own image, in the image of Elohim created [they] him; male and female created [they] them. It was written that the Gods took dust of the earth, and from that dust created the first man. From the man's rib, a female was created to be a companion for the man. The first man was named "Adam", which means dust. Adam named his companion "Eve", which means mother of all living. Notice that I put "us" and "our" and "their" in bold print. That is because clearly the ancient Hebrews knew of the plurality of Gods. The later Hebrews came to know only ONE GOD, Jehovah, but it is suspected by this author, that it was NOT to deny the existence of other gods, but that only one should be worshipped. Jehovah, was therefore, king of the Gods (the king of kings, the lord of lords), and the only one to deserve obeisance. Baal (also spelled Bel) was the Hittite equivalent to Jehovah, and so why the Israelites should take so much offense at the worship of Bel is unknown. Perhaps it had less to do with Bel, and more to do with the manner in which the Hittites worshipped, by self-mutilations and possibly even human sacrifices. From the flesh of the god there was a spirit. And so that this was not forgotten there was a spirit. She summoned the Anunnaki, the great gods. He trod the clay in her presence. Ea, seated before her, was prompting her. She nipped off fourteen pieces of clay. Seven she put on the left. They completed them in pairs. The first world to exist was Muspell, a place of light and heat whose flames are so hot that those who are not native to that land cannot endure it. Surt sits at Muspell's border, guarding the land with a flaming sword. [That's interesting!] At the end of the world he will vanquish all the gods and burn the whole world with fire. Beyond Muspell lay the great and yawning void named Ginnungagap, and beyond Ginnungagap lay the dark, cold realm of Niflheim. Ice, frost, wind, rain and heavy cold emanated from Niflheim, meeting in Ginnungagap the soft air, heat, light, and soft air from Muspell. Where heat and cold met appeared thawing drops, and this running fluid grew into a giant frost ogre named Ymir. Ymir slept, falling into a sweat. Under his left arm there grew a man [not human, I'm guessing] and a woman [likewise not human, I'm guessing]. And one of his legs begot a son with the other. This was the beginning of the frost ogres. Thawing frost then became a cow called Audhumla. Four rivers of milk ran from her teats, and she fed Ymir. The cow licked salty ice blocks. After one day of licking, she freed a man's [humanoid, but not yet human, I'm guessing] hair from the ice. After two days, his head appeared. On the third day the whole man was there. His name was Buri, and he was tall, strong, and handsome [Well, there was no basis for comparison]. Buri begot a son named Bor, and Bor married Bestla, the daughter of a giant [Where did the giants come from? Frost Ogres?]. Bor and Bestla had three sons: Odin was the first, Vili the second, and Vé the third. It is believed that Odin, in association with his brothers, is the ruler of heaven and earth. He is the greatest and most famous of all men [humanoids]. Odin, Vili, and Vé killed the giant Ymir. When Ymir fell, there issued from his wounds such a flood of blood, that all the frost ogres were drowned, except for the giant Bergelmir who escaped with his wife by climbing onto a lur (a hollowed-out tree trunk that could serve either as a boat or a coffin). From them spring the families of frost ogres. The sons of Bor then carried Ymir to the middle of Ginnungagap and made the world from him. From his blood they made the sea and the lakes; from his flesh the earth; from his hair the trees; and from his bones the mountains. They made rocks and pebbles from his teeth and jaws and those bones that were broken. To protect themselves from the hostile giants, the sons of Bor built for themselves an inland stronghold, using Ymir's eyebrows. This stronghold they named Midgard. While walking along the sea shore the sons of Bor found two trees, and from them they created a man and a woman [the first humans]. Odin gave the man and the woman spirit and life. Vili gave them understanding and the power of movement. Vé gave them clothing and names. The man was named Ask [which is the old spelling of Ash (the tree)] and the woman Embla [which some say could mean Elm, but I think means Emma (all-container; i.e., womb of all)]. From Ask and Embla have sprung the races of men who lived in Midgard. The primal being (Purusha) was sacrificed. He became butter. From that butter, all things in heaven and earth were created, including the gods, and including the first mortals (humans): Yama & Manu. There are two versions. Both versions agree on Dan Gun's pedigree. He was begotten by his father, Hwan-ung, son of the god Hwan-in. Nothing is mentioned about the origins of Hwan-in. One version says the heaven and earth were one, and all animals could communicate with humans and gods. Hwan-ung wanted earthly rule, so his father, Hwan-in sent him to earth to gain his desire. With him, Hwan-ung took the lower-level gods of Wind General, Rain Governor, and Cloud Teacher. (I personally think that "master" is probably a better translation over "teacher"). Also, Hwan-ung took three thousand other lower-level gods. (probably as servants and/or soldiers). The other version say that the gods were living on earth and Hwan-in sent his son, Hwan-ung to the East to establish a new country/kingdom. With him, Hwan-ung took three thousand "followers" (probably lower level gods). Also, he took Lord of Wind, Master of Rain, and Master of Clouds. Hwan-ung and his entourage is reported to have settled at Tae Baek Mountain (which is in what is currently known as North Korea). Hwan-ung met a tiger and a bear who "prayed" to become human. Hwan-ung proposed a test, which if completed would make the contestant a human. The tiger and bear (both female I guess, 'cause you'll see why later), were given wormwood and twenty cloves of garlic and told to stay out of the sunshine (in a cave) for 100 days. The tiger could not endure. The bear did endure, and after 100 days, became a human (woman). The woman was lonely. And prayed for a mate. So, Hwan-ung took her as a wife, and Dan Gun was born as a result of their union. Dan Gun is said to be the progenitor of the Korean race. It should be noted that Version 2 (of the legend of Dan Gun) gives another name for the mountain besides "Tae Baek" (which would be Sino-Korean, Tae being (Great) and Baek being (White). The other name of the Mountain is "Myo Hyang" Mountain, which sounds very "Pure" Korean to me, and may be the pure-Korean name of the mountain that I have been looking for. Incidentally, it is the tallest mountain on the Korean peninsula, if that means anything to you (it does, to me). According to myth, the Tibetan people owe their existence to the union of an [extra-terrestrial] ogress and a [terrestrial] monkey on Gangpo Ri mountain at Tsetang. The word "ogre" is often a mistranslation, because what people in the WEST think of an "ogre", and what the people in the FAR EAST think of whatever the word "ogre" is translated from, are two different things. While appearance may be similar, they are quite different in disposition. Among the Miao, Yao, Li and other nationalities of southern China, a legend concerns Pan Gu the ancestor of all mankind, with a man's body and a dog's head. It runs like this: Up in Heaven the God in charge of the earth, King Gao Xin, owned a beautiful spotted dog. He reared him on a plate (pan in Chinese ) inside a gourd (hu, which is close to the sound gu ), so the dog was known as Pan Gu . Among the Gods there was great enmity between King Gao Xin and his rival King Fang. "Whoever can bring me the head of King Fang may marry my daughter," he proclaimed, but nobody was willing to try because they were afraid of King Fang's strong soldiers and sturdy horses. The dog Pan Gu overheard what was said, and when Gao Xin was sleeping, slipped out of the palace and ran to King Fang. The latter was glad to see him standing there wagging his tail. "You see, King Gao Xin is near his end. Even his dog has left him," Fang said, and held a banquet for the occasion with the dog at his side. At midnight when all was quiet and Fang was overcome with drink, Pan Gu jumped onto the king's bed, bit off his head and ran back to his master with it . King Gao Xin was overjoyed to see the head of his rival, and gave orders to bring Pan Gu some fresh meat. But Pan Gu left the meat untouched and curled himself up in a corner to sleep. For three days he ate nothing and did not stir. "Why don't you eat? Is it because I failed to keep my promise of marrying a dog?" To his surprise Pan Gu began to speak. "Don't worry, my King. Just cover me with your golden bell and in seven days and seven nights I'll become a man." The King did as he said, but on the sixth day, fearing he would starve to death, out of solicitude the princess peeped under the bell. Pan Gu's body had already changed into that of a man, but his head was still that of a dog. However, once the bell was raised, the magic change stopped, and he had to remain a man with a dog's head. He married the princess, but she didn't want to be seen with such a man so they moved to the earth and settled in the remote mountains of south China. There they lived happily and had four children, three boys and a girl, who became the ancestors of mankind. They lived between 2852 BCE and 3322 BCE. They were the first of the San Huang: The Three August Ones and the Five Emperors (三皇五帝;san1 huang2 wu3 di4). (AKA: the mythological rulers of China during the period preceding the Xia Dynasty in Chinese mythology from 2500 BC to 2205 BC). With Fu Xi, Nu Wa is often depicted with the upper body of a woman and the lower body of a snake or dragon. [Compare Hindu Nagas]. It is said that Nuwa began creating men from yellow clay sculpting each one individually yet after she had created hundreds of figures in this way she still had more to make but had grown tired of the laborious process. So instead of hand crafting each figure she dipped a rope in clay and flicked it so blobs of clay landed everywhere each of these blobs became a person. In this way, the story relates that nobles were created from the hand-crafted figurines, and commoners were created from the blobs. Another variation on this story relates that some of the figures melted in the rain as Nuwa was waiting for them to dry and in this way sickness and physical abnormalities came into existence. It has been proven that the North American Aborigines are genetically related to the Mongoloid race, and must have migrated from East Asia millennia ago. 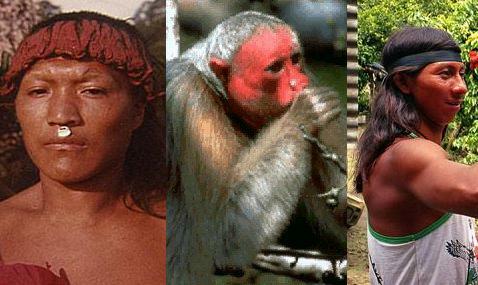 South American Aborigines may actually be of a completely different race of human beings (i.e., NOT Mongoloid). You'll see what I mean if you keep reading. There was another world before this one. But the people of that world did not behave themselves. Displeased, the Creating Power set out to make a new world. He sang several songs to bring rain, which poured stronger with each song. The Creating Power then took many animals and birds from his great pipe bag and spread them across the earth. From red, white, black, and yellow earth, he made men and women. The Creating Power gave the people his sacred pipe and told them to live by it. He warned them about the fate of the people who came before them. He promised all would be well if all living things learned to live in harmony. The first people came up through three worlds and settled in the fourth world. They had been driven from each successive world because they had quarreled with one another and committed adultery. In previous worlds they found no other people like themselves, but in the fourth world they found the Kisani or Pueblo people. The surface of the fourth world was mixed black and white, and the sky was mostly blue and black. There were no no sun, no moon, no stars, but there were four great snow-covered peaks on the horizon in each of the cardinal directions. Late in the autumn they heard in the east the distant sound of a great voice calling. They listened and waited, and soon heard the voice nearer and louder than before. Once more they listened and heard it louder still, very near. A moment later four mysterious beings appeared. These were White Body, god of this world; Blue Body, the sprinkler; Yellow Body; and Black Body, the god of fire. Using signs but without speaking, the gods tried to instruct the people, but they were not understood. When the gods had gone, the people discussed their mysterious visit and tried without success to figure out the signs. The gods appeared on four days in succession and attempted to communicate through signs, but their efforts came to nothing. "You do not seem to understand our signs, so I must tell you what they mean. We want to make people who look more like us. You have bodies like ours, but you have the teeth, the feet and the claws of beasts and insects. The new humans will have hands and feet like ours. Also, you are unclean; you smell bad. We will come back in twelve days. Be clean when we return." On the morning of the twelfth day the people washed themselves well. Then the women dried their skin with yellow cornmeal, the men with white cornmeal. Soon they heard the distant call, shouted four times, of the approaching gods. When the gods appeared, Blue Body and Black Body each carried a sacred buckskin. White Body carried two ears of corn, one yellow, one white, each covered completely with grains. The gods laid one buckskin on the ground with the head to the west, and on this they placed the two ears of corn with their tips to the east. Under the white ear they put the feather of a white eagle; under the yellow the feather of a yellow eagle. Then they told the people to stand back and allow the wind to enter. Between the skins the wind wind blew from the east and the yellow wind from the west. While the wind was blowing the eight of the gods, the Mirage People, came and walked around the objects on the ground four times. As they walked, the eagle feathers, whose tips protruded from the buckskins, were seen to move. When the Mirage People had finished their walk, the upper buckskin was lifted. The ears of corn had disappeared; a man and a woman lay in their place. The white ear of corn had become the man, the yellow ear the woman, First Man and First Woman. It was the wind that gave them life, and it is the wind that comes out of our mouths now that gives us life. The Akamba say that God lowered the first pair or two of mankind from the clouds to the earth. They brought with them cattle, sheep and goats; and the two pairs reproduced so that their children intermarried and formed families of mankind on earth. In a related set of myths, it is held that among the Maasai and Nandi that men came originally from a leg or knee. This knee or leg belonged to some other being, evidently like men. The leg got swollen until finally it burst, letting out a male person on one side and a female on the other side. .....All the animals of the earth and the ocean and the air had gone to their proper places, had taken on the life that had been given them, but they could not name the old ones. Each animal spoke with the voice of its kind but could not speak the names that they had been commanded to speak. You do not obey us, and so your lives will be very different. You will live lives of fear, lives spent in causing fear and in feeling fear. You will eat other animals, and you will be eaten. We know who we are, and we know who made us. We know that there is much more that we do not know, but we know that in time, it will be shown to us. Then, they fell into a deep sleep, and while the slept, the old ones made women to be their companions. And so, the earth was populated, and the new generations worked and prayed and learned the names in which they heard the story of their birth and of their life and of their death. So let us, even now, remember and honor the names of Water, Fire, and Thunder, and let us listen to the stories that we hear in those names. There was a time when everything was still. All the spirits of the earth were asleep - or almost all. The great Father of All Spirits was the only one awake. Gently he awoke the Sun Mother. As she opened her eyes a warm ray of light spread out towards the sleeping earth. At first the animal children lived together peacefully, but eventually envy crept into their hearts. They began to argue. The Sun Mother was forced to come down from her home in the sky to mediate their bickering. She gave each creature the power to change their form to whatever they chose. However she was not pleased with the end result. The rats she had made had changed into bats; there were giant lizards and fish with blue tongues and feet. However the oddest of the new animals was an animal with a bill like a duck, teeth for chewing, a tail like a beavers and the ability to lay egg. It was called the platypus. The Sun Mother looked down upon the Earth and thought to herself that she must create new creatures less the Father of All Spirits be angered by what she now saw. She gave birth to two gods: the Morning Star (male) and the Moon (female). Two children were born to the Morning Star and Moon, and these she sent to Earth. They became our [human] ancestors. She made them superior to the animals because they had part of her mind and would never want to change their shape. There was a great Creator, known by such tribal names as Baiamai, Punjil, Nuralli, who made all things, and who still lives in the heavens above; in the work of creation, he carried a great knife, with which to shape the toil of his hands; in this work he is assisted by a demiurge whom the Kamalarai tribe call Dharamulan, and certain birds and animals are also associated with him as agents; Punjil first made two men each of a lump of clay, which he gradually fashioned from the feet upwards into the human form; and, as the figures grew in symmetry and beauty, he danced round them, well satisfied with his work; then he breathed very hard on them and they lived, and began to move about as full-grown men. The one had straight hair, and the other had curly hair. Punjil's brother had control of all waters, great and small; and so, one day, he brought up by a hook from a muddy-pool two young women, and they became the companions of the two men. Some time after, Punjil came down and visited the camp of the humans; and, becoming very angry, he used his great knife on the men, women, and children there, and cut them into very small pieces, which still lived and wriggled about like worms; these he carried into the sky, and then dropped them wherever he pleased; the pieces became men and women, and peopled the whole land. To people these lands, he causes Tangaloa-sāváli to take a native climbing-plant, a Fue, and lay it outside in the sun. Under the Sun's heat, its juice brought forth a great multitude of worms; these, Tangaloa fashioned into men and women, and gave them intelligence, and thus he peopled the lands. [There seems to be a double strand, because Fue is also said to be Tangaloa's son, as well as a vine, that grows on the Samoan island(s)]. The first man was created from earth, and the first woman was created from the rib of man (in the image of the gods). [But the story, as it is written in the Bible is not to be taken literally. One should consult the Kaballah for an interpretation of the Bible]. Humans were created from the flesh of a god. The frost ogres (possibly primitive hominids) were created from the armpit of a god, but were destroyed by a great flood; and, humans were created from trees: Ash and Elm (probably not to be taken literally; probably a kind of metaphor). Humans were created by the union of a god and a bear. Humans were created by the union of a supernatural being (possibly E.T.) and an earthly ape or monkey. Humans were the product of the union of a celestial dog and a goddess princess. Humans were created by the goddess Nu Wa out of clay, AND the spittle of GODS. There's reference to a pre-human race of hominids. Humans were created from red, white, black, and yellow earth by God. There's some reference to primitive, earthly, animal-like "people" (possibly bears or primates), and humans were created from corn and eagle feathers on a buck skin (probably not to be taken literally; probably metaphorical). The first man and first woman were created from the legs of a god. Humans are the descendants of gods. Humans were created from clay and given life from the BREATH of a god; THEN, a god cut up the original humans and living worms (DNA strands?) emanated from their bodies. Those "worms" were distributed throughout the earth and grew into humans. In the MONGOLOID myths, we see THREE references to mixture of god DNA and animal DNA. WOW! Now that is just uncanny! Why hasn't anybody picked up on this yet? Am I the only one who sees what our ancient stories are trying to convey to us? Humans did not evolve from apes. They were genetically engineered by extra-terrestrials (gods) who inserted their own DNA into terrestrial fauna (bears, dogs, monkeys). There is support for my FOUR-ADAMS theory in the Lakota, Navajo, and even some Chinese creation myths. (Well, it's not my theory, is it?). The Lakota myth is of particular interest to me, because it makes allusion to there having been four original humans, one made of red earth, one made of white earth, one made of black earth, and one made of yellow earth. There the four major races of humans on the earth. First of all, I contend that no single creation myth holds all the truth. We need to look at them as a collective. If it is true that all humans "sprang" from a few select proto-humans, then it would seem logical that all the humans would have handed down the same story of their creation. Bits and pieces get lost along the way. One culture retains parts that other cultures have forgotten. It is up to us (in modern times) to put the pieces together and find the whole truth. That is my quest. Secondly, I contend that humans did not evolve from single-celled organisms. I believe that all living mammals evolved from single-celled organism, but as far as humans are concerned, there are two HUGE gaps in the fossil record. NOW WAIT A MINUTE (PLEASE)! Before you go off thinking that I'm a creationist, let me explain further. I can account for those two GAPS in the fossil record. I do not believe that the "gods" are anything more than extra-terrestrial humanoid beings, obviously very far advanced than we. BUT, I have no problem with calling them "gods". So, I will. All antediluvian humans killed by the great deluge; gods made humans again from various colors of clay. First "humans" had teeth and claws of beasts and could not learn the "signs" of the gods; gods tried again with corn. Note: the fourth Adam is the same as the third, only after the "Fall"; hence, he is called "Fallen Adam". In fact, I think that all three (or four) are actually the same being... transformed via the 3 steps: from spirit being to a physical androgyne, then divided into Adam & Eve. It is clear from human recorded history that there was a PROCESS involved in the creation of humans. There were two or three "step" in the process. I, therefore, contend that the gods (Extra terrestrial beings) conducted genetic engineering upon terrestrial creatures. I am a biology teacher. One thing that scientists (paleontologists/anthropologists) cannot explain are various LEAPS OF EVOLUTION. There are two leaps that I would like to focus upon. In my opinion there isn't one "missing link"; there are 2 "missing links" in the evolutionary chain from amoeba to human. Believe it or not, I have a possible explanation for those aforementioned "LEAPS" or so-called "missing links". The first jump of evolution: The bear is the closest mammal to the primates (in my opinion) because the hind limbs of a bear are designed more like a primate's hind limbs. But, whether it was a dog or a bear, doesn't matter to me. The point is that the gods inserted their DNA into terrestrial mammals to create early primates (the great apes). The second huge leap of evolution: Then, those early primates could not learn the written language of the gods (and were not obedient). So, the gods tried again. They inserted more DNA and... Presto! Homo Sapiens! When you look at the following pictures (photos), I want you to perceive the primate as a hybrid of a god and a bear or a dog; and perceive the adjacent humans as hybrids of the primate and a god. Are you getting freaked out yet? I am! Then, in Africa, you've got gorillas... black skin, black hair. You've also got the origin of the Negroid race of humans on that continent (not necessarily the Nile, like I mentioned above). Then, in East Asia, you've got the Orangutan, which of course has orange skin and orange hair. The orange is just indicative of a greater concentration of beta-carotene, which in lesser concentration is yellow. You will notice that East Asians have a yellowish hue to their skin, if un-tanned, but when exposed to the sun, their skin turns to an orangish-brownish color. I know what you are thinking - You are wondering: "Why don't apes have mustaches?" You know what? Maybe the Korean myth is closer to the truth than the Tibetan one. Many Darwinists say that humans evolved from apes (gorillas, orangutans, chimpanzees). Yet not one of the so-called "great apes" have mustaches! 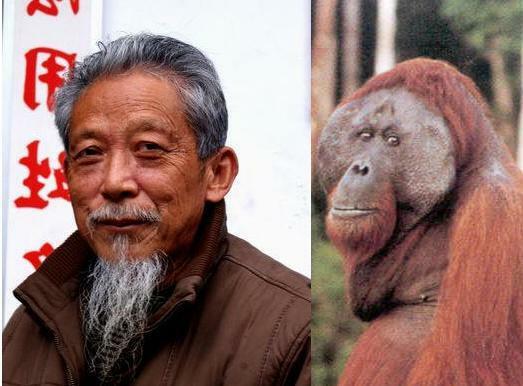 (Well, the male orang-utan has a bit of a mustache, and the others have a few whiskers, but nothing like the male human). I have struggled with this for years! I mean we humans seem to think we are so smart and that we have vestigual body hair from our ape ancestors. BUT wait! Most male gorillas don't have chest hair, either. Neither do male orang-utans. Well, I guess that isn't surprising, considering negroids and mongoloids don't have any chest hair either. BUT, if we came from apes, where do the mustaches come from? Huh? Come on scientists, I challenge you to answer me that one! I'm ready! How come apes don't have mustaches and humans do??? Bears, on the other hand, do have mustaches. Another thing, most apes have opposable big toes, and humans DON'T. Oh! Now the plot thickens! Yes! Perhaps the Koreans are the only people on the planet who kept the story straight all these millennia. What if the extra-terrestrials were totally hairless humanoids and they mixed their DNA with that of a terrestrial bear. Would not the result be anything between a hairy ape and a slightly hairy being, much like we humans? It would all depend upon HOW MUCH DNA was inserted from the extra-terrestrial beings, wouldn't it? Perhaps we are NOT naked apes, but rather, NAKED BEARS! No. I cannot accept that we are descendants of apes. Because there are too many anatomical differences between apes and humans. What if the apes that we see today, are the remnants of the "failed" attempts to create intelligent (language-able) hybrids here on this humungous globular pitri dish that we call home? What if the apes ARE related to us, but NOT in a direct lineage? "Nope. That won't do. Not good enough. Try again." 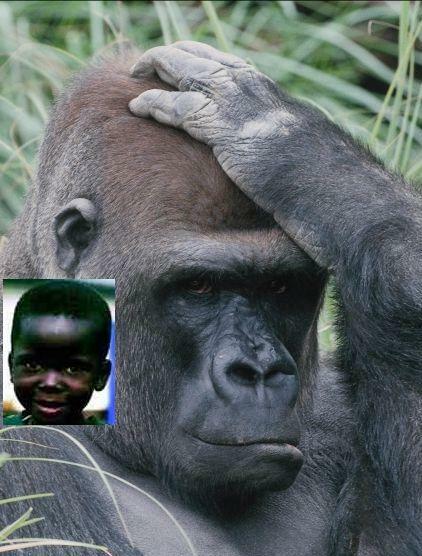 And, they inserted MORE of their DNA into the great apes, and created Homo Sapiens (all four races). So, we could be NAKED APES, after all. You've got a bunch of completely hairless humanoid beings from another planet. They are a highly advanced civilization, and they are scientists, mostly zoologists, microbiologists and geneticists. They find earth, and see a potential for "peopling" this planet. They do many many experiments, inserting their DNA in various terrestrial species. The combine their DNA with various four-legged beasts, and vwallah! Apes began to appear on the earth. This, however, is not satisfactory. In fact, many of the extra-terrestrial scientists get together and decide that they should start over, because the apes that they had created were making a mess of the planet, and were extremely promiscuous, and would not heaken unto the words of their creators. Only eight (four pairs) of apes were saved [a pair of gorillas, a pair of chimps, a pair of orang-tans, and a pair of uakari]. 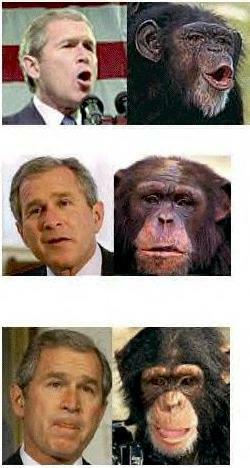 The scientists then inserted MORE of their DNA into the apes, and vwallah! Humans began to appear on the earth. Humans show promise. They can learn to speak the language of the extra-terrestrial. They are tested to see if they will obey their creators. They are commanded to "multiply and REPLENISH the earth." That word: replenish... does it not register in the minds of those who read the Judaeo-Christian Bible? What did the Gods mean, when they said, "Replenish the earth"? The Gods did not say, "Plenish the earth." They said, "REplenish the earth." We now know, from archeology and ancient anthropology that humans were NOT the first humanoids to populate this planet. Furthermore, ancient art (prehistoric art) shows depictions of aircraft, much like flying saucers. Were they the transports of our creators? Did Ezekiel see our creators visiting us via such aircraft? Was Jeshua bar Joseph, ben David, the actual spawn of our creators via artificial insemination? Was he, perhaps, tutored directly by his genetic father? Was he asked to by his father to teach us? If so, where are our creators now? Why do they hide themselves from us? What purpose do they have for us? Is this earth no more than a rat maze? Our we nothing more than guinea pigs?